By Raymond Britt -- What's the right amount of time/hours per week to train for a marathon , triathlon or Ironman Triathlon ? The answer is: less than you think. Perhaps a lot less than you think. And that’s good news, because triathlon is really just a hobby, the kind of activity that should fit around the most important things in your life: family, friends and work. 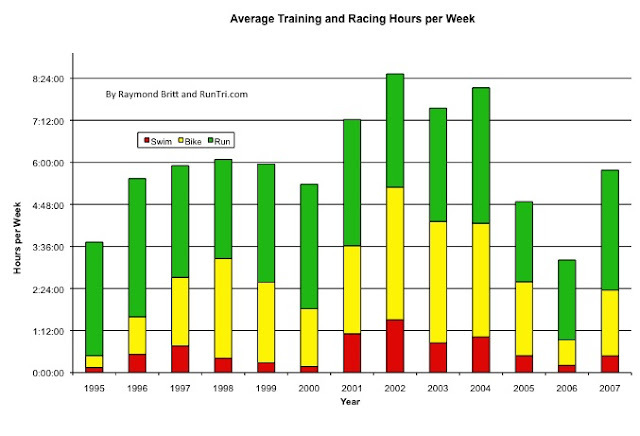 Simple math translates these numbers to about an hour or so of training per day. That’s nothing. Of course, my training hours per week can be more during race season and less in the off-season, but not substantially, on the whole. For examples, look at my Training Plans. All my training detail for the last several years is there to help bring the examples in this column to life. My reaction: impossible for mere mortals like you and me Yet I’ve earned a spot at the triathlon World Championships three times while training less than half the ‘prescribed’ time time. Maybe that’s not right for everyone, but my point is you don’t need to dedicate insane amounts of training time to meet your goals. I entered my first real triathlon season as primarily a runner, with all of 18 months experience and a couple of slow marathons under my belt. My goal was to finish the Chicago Triathlon Olympic Distance event with a reasonable time and a smile on my face. To do that, I needed to improve my swim and cycling skills. You may have a similar situation. You do not need to overdo it, however. In that first triathlon year, I trained for an average of 5 hours and 30 minutes per week. That’s less than an hour per day. My average swim that year was about 30 minutes long, and my average bike ride lasted a little over one hour. Completely manageable. Very simple: all you need to do is find that hour or less, early morning, on a lunch break, or after work, get a good workout, and return to your regularly scheduled life. And you’ll do just fine in your first triathlon. For those who have some triathlon experience, maybe you’re considering a longer distance, say a Half Ironman or a full Ironman . Many people balk at the thought, thinking they need to significantly increase their training time to compete at that level. I’m here to tell you, it’s not necessarily true. The year after meeting that first real triathlon goal – finish with a reasonable time and a smile – I decided to go for it all. Full Ironman triathlon, in Canada. I was excited but also more than aware of the realities of Real Life: I had a very interesting job with extensive travel, and young children at home, both of which took priority. I had to make the most of the opportunities I had. My average swim workout increased to 45 minutes, and my average rides ranged from one to two hours, but overall the total time commitment didn’t vary much. When the final tally was done, I finished not one, but two Ironman triathlons that year, averaging only 6 hours of training per week. And when I decided to get really serious, my training bumped up to average 10 hours per week in peak season (and 6 hours otherwise), but 5am sunrises helped me train before the kids woke up and my work day began. My running continued to be solid, so the increases came in swim time (up to one hour per session) and cycling (three hours or more early Saturday morning before breakfast). And the extra two hours (only!) per week led me to the Ironman World Championships three consecutive years. Again, on average it all worked out to about an hour per day for a great triathlon season. You can do that. I know you can. With less training time you need to make those workouts count. Less time and higher quality beats more time any day. You can accomplish more than you ever thought possible while maintaining the balance you want in life.